We know full well that for many out there the ultimate trail bike needs to possess the agility and responsiveness that comes with 650b wheels. We tend to agree which is why we developed the S-Works Stumpjumper 650b. It reflects everything that weve learned over the years and in our eyes represents the pinnacle of trail performance. Starting at the carbon layup it features our highest-end FACT 11m for an ultra-lightweight strong and stiff construction. The carbon moulding process also allowed us to revolutionize how you carry your trail essentials with the all-new SWAT™ Door found at the down tube. This compartment will fit a tube a tool and pump without rattling or compromising the structural integrity of the frame. Further improving the ride youll also find an aggressive trail-eating geometry that features ridiculously short chainstays a roomy top tube a low bottom bracket a slacked out front end and our proprietary Rx Trail Tune at the shock. For this S-Works model we outfitted it with a build spec that spares no expense. This means that its loaded with a full SRAM XX1 Eagle groupset SRAM Guide RS brakes Öhlins front and rear suspension and hand-built Roval Carbon wheels. So with this Stumpjumper you have a bike that without a doubt is ready for anything on the trail. FACT 11m carbon fibre Trail Chassis with Stumpjumper FSR full carbon rear end blends stiffness with light weight to form the pinnacle of efficiency while fully enclosed cable routing and an integrated SWAT™ Door create exceptional handling and zero-hassle storage. The Öhlins RXF 36 fork was designed to be the gold standard in frontend suspension. It operates off of a three-chamber air spring design (two positive and one negative) and it utilizes proprietary TTX damping technology. Combined this allows both parallel and separated oil flow that controls the overall pressure levels. The XX1 Eagle drivetrain is the pinnacle of shifting performance floating through the 12-speed cassette with crisp precise shifts. 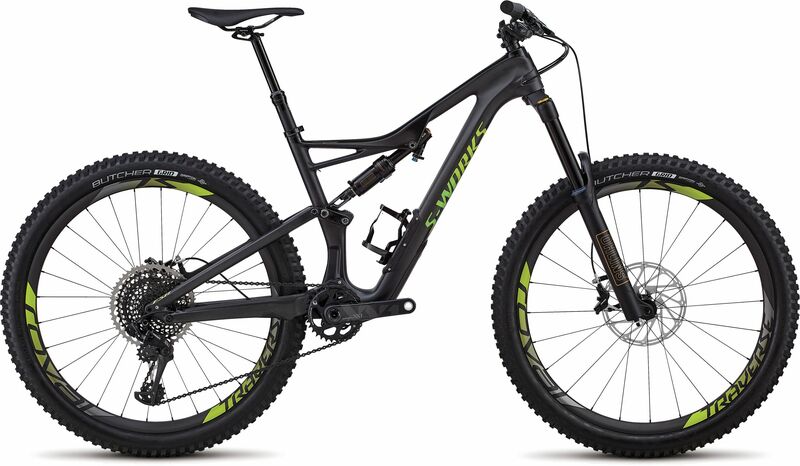 Please see below for delivery options for Specialized S-works Stumpjumper 650b Mountain Bike 2018.